Zero Gravity reduces the stress on your spine. The Zero Gravity Lift Chair position allows the feet to raise to the same level as your heart and the strain of gravity on the vertebrae is reduced, relieving the discomfort of back pain. 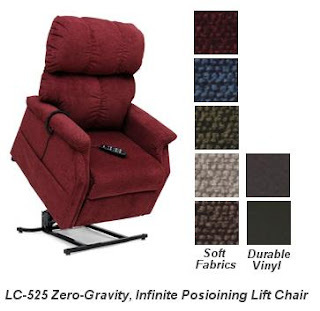 The new LC-525 Lift Chair from Pride Mobility offers both Zero Gravity and Infinite Positioning for maximum comfort and functionality.The LC-525 includes a fully padded ottoman (no gap between ottoman and seat), plush padded back and seat, and battery backup in case of a power outage. Available in Petite Wide, Small, Medium and Large.